This puts me in the odd role of switching sides, so to speak, and observing that greenhouse warming could very likely manifest itself as rising nighttime lows (rather than rising daytime highs). I can only assume the surrounding area of Arizona did not see the same sort of records, which would support the theory that this is a UHI effect. 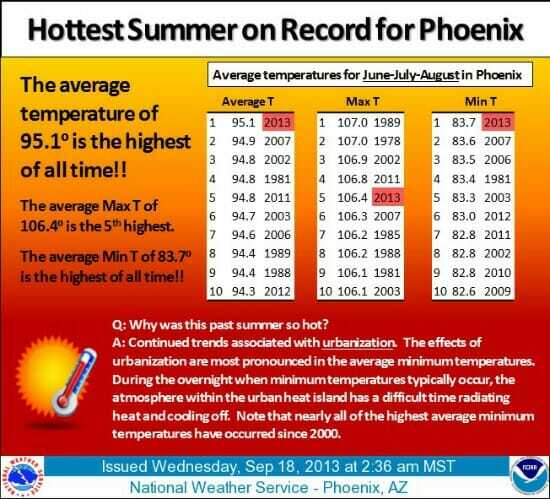 Phoenix has a huge urban heat island effect, which my son actually measured. At 9-10 in the evening, we measured a temperature differential of 8-12F from city center to rural areas outside the city. By the way, this is a fabulous science fair project if you know a junior high or high school student trying to do something different than growing bean plants under different color lights.